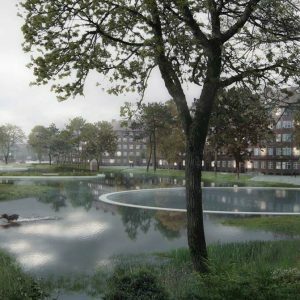 SLA is Danish based landscape architecture office operating within the fields of urban space, city planning and landscape architecture. 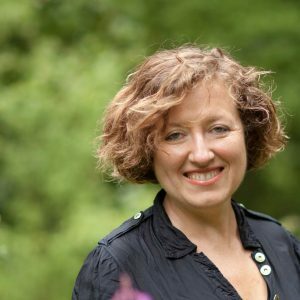 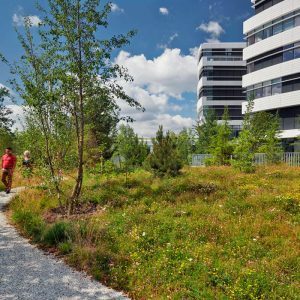 The company was founded in 1994 by Stig L. Andersson and today SLA engages 70 employees from a multidisciplinary team consisting of architects, landscape architects, planners, biologists, forests engineers, anthropologists and gardeners. 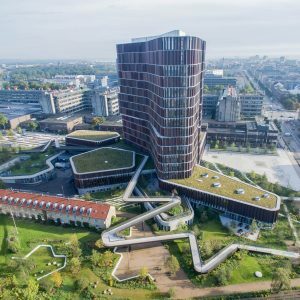 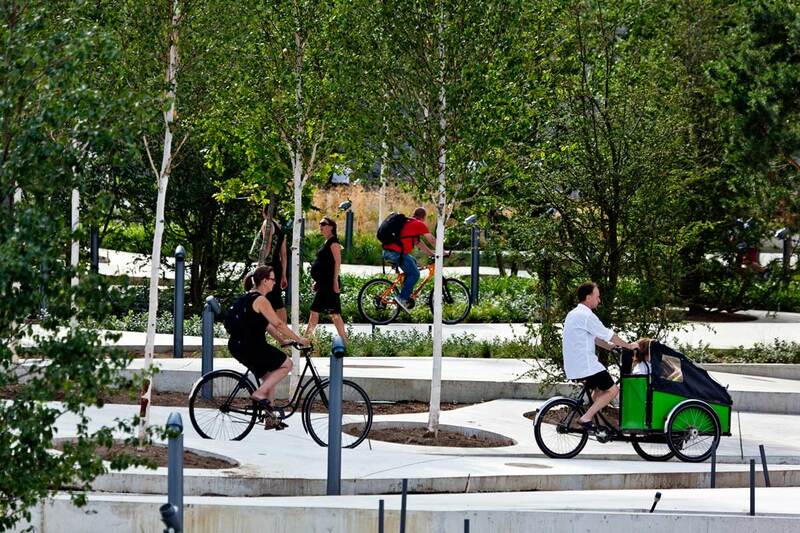 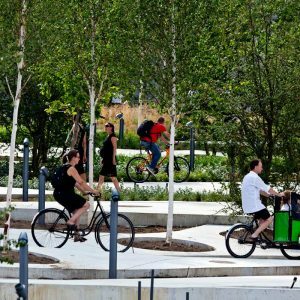 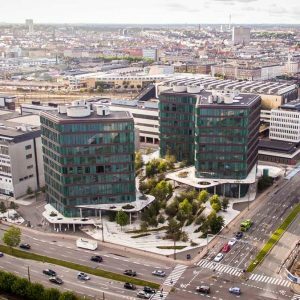 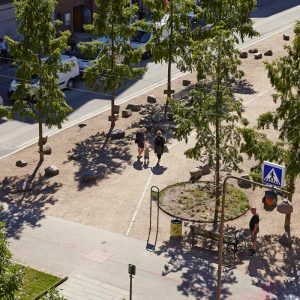 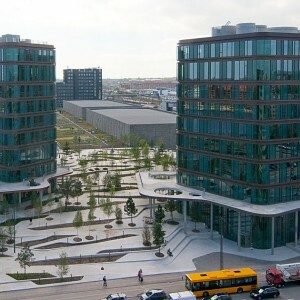 From offices in Copenhagen, Oslo and Aarhus, SLA designs some of Scandinavia’s most democratic, climate-friendly and contemporary urban landscapes and public spaces. 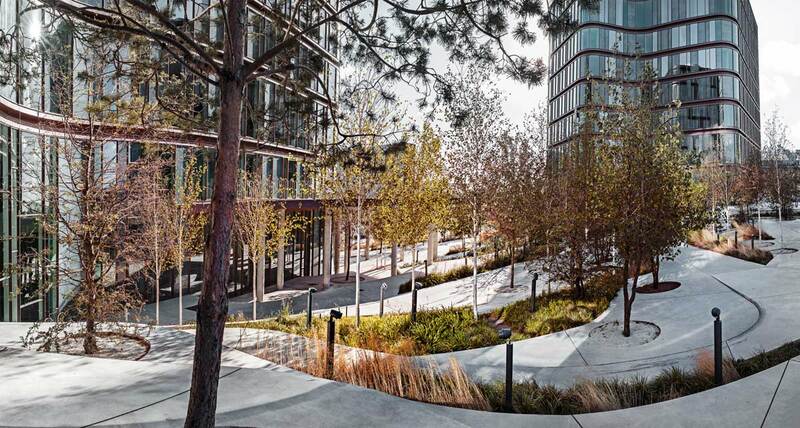 At SLA, we use a nature-based design approach to create modern, sustainable and adaptable cities, that inspire community and diversity through nature’s amenity and utility values. 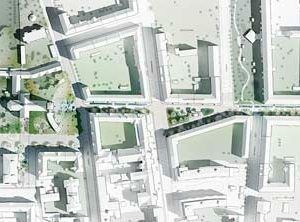 Our projects aim to solve some of today’s hardest urban problems, while increasing life quality and adding new social and cultural meaning to our cities. 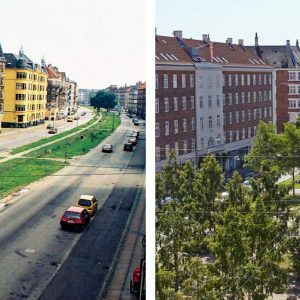 To do so, we have for the last 20 years based our work on a New Nordic Model for urban development. 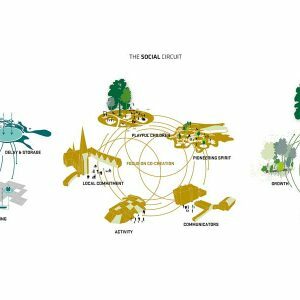 The model bases on co-creation, dialogue and humanistic nature-based design solutions to solve physical, social and economic challenges. 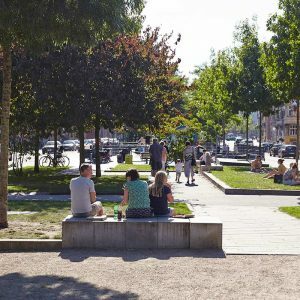 We found all urban development in local and site-specific circumstances, using the local, social and cultural life as well as the specific physical and economic challenges of the area as starting point for solutions. 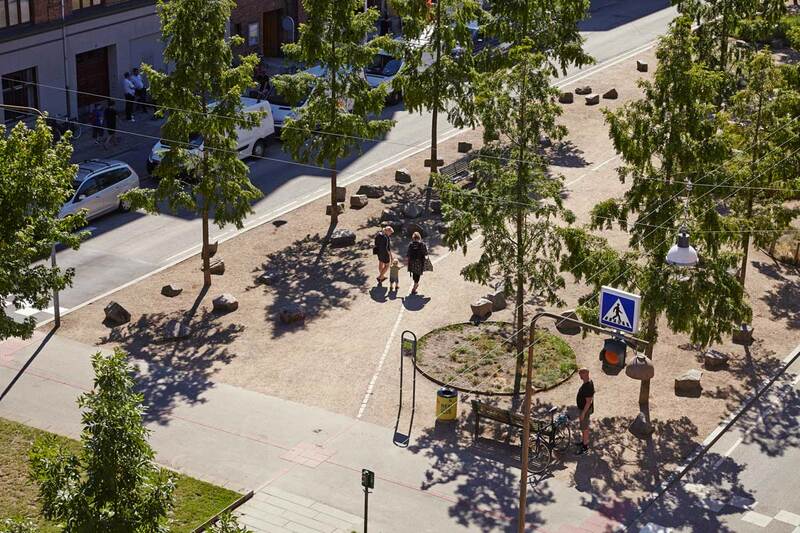 The New Nordic Model’s strong foundation in the principles and processes of nature, makes it highly scalable to different settings and conditions around the world. 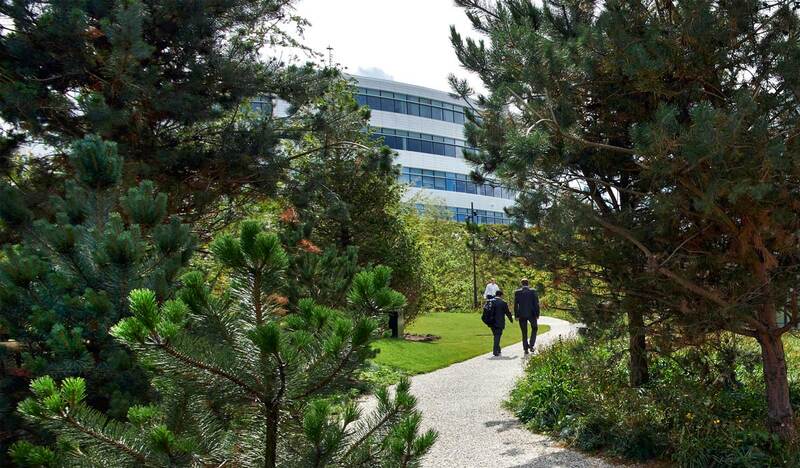 Nature is the focal point of everything we develop, draw and think at SLA. 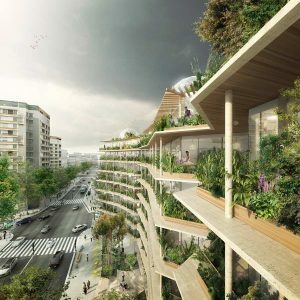 Because the order of nature is the starting point of how we organize our world and for how we create the framework in which life can unfold fully. 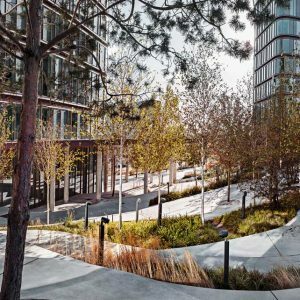 Thus, to us nature is our livelihood and architecture, master planning, urban spaces and landscapes are just some of the tools that we use to put nature’s processes into play. 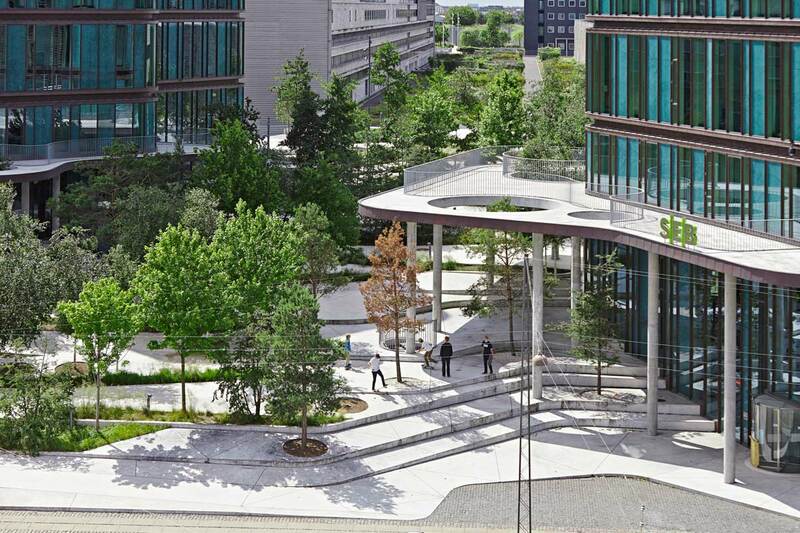 What distinguishes us from our colleagues is our fundamental approach: That nature’s grown environment and the constructed and built environment differ from one another and to us they together constitute a holistic architecture. 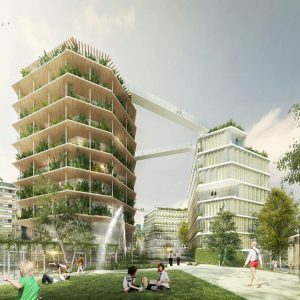 We base our projects approach on the philosophy of optimizing multi- and interdisciplinary collaborations to develop solutions which reflect a scientific understanding of how the physical conditions, geography, climate and resources interact with the human experience of space. 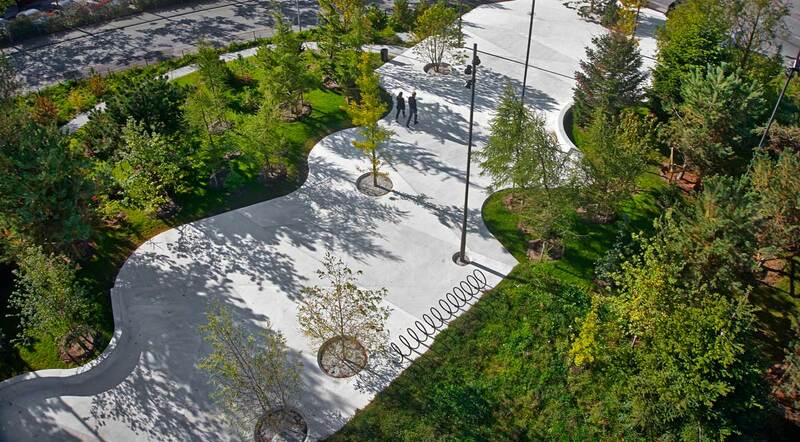 We constantly seek to expand these collaborations to make changes that are innovative and aesthetically meaningful. 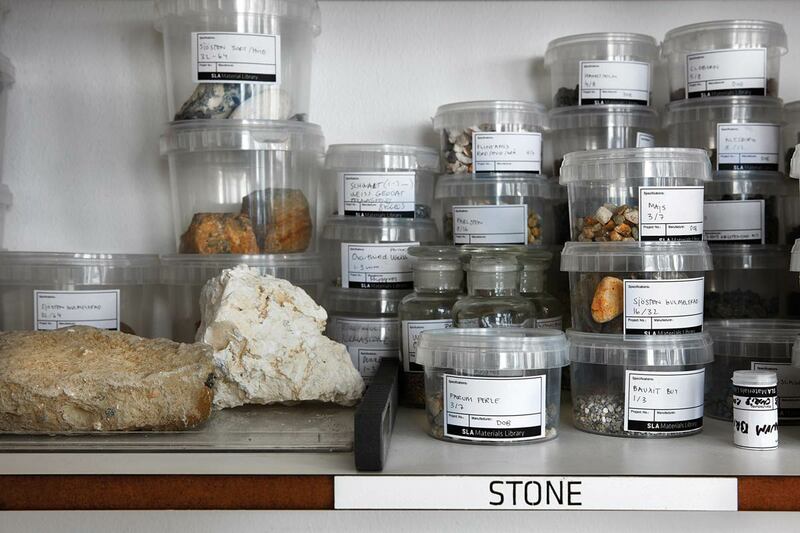 To do so, our library and material collection are important in underpinning our work. 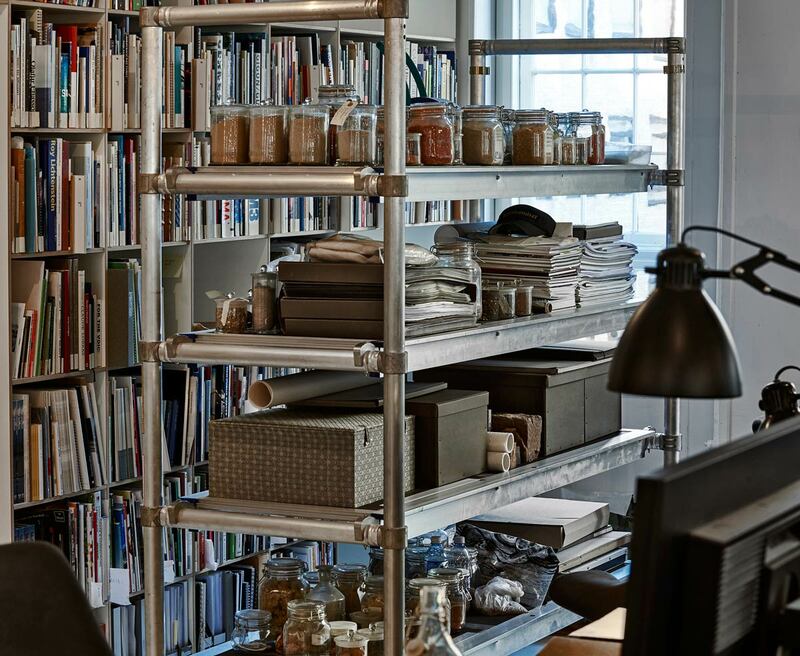 Our book collection holds more than 5000 titles, including books on Japanese gardens and philosophy, fungus and biodiversity, quantum mechanics and art history. 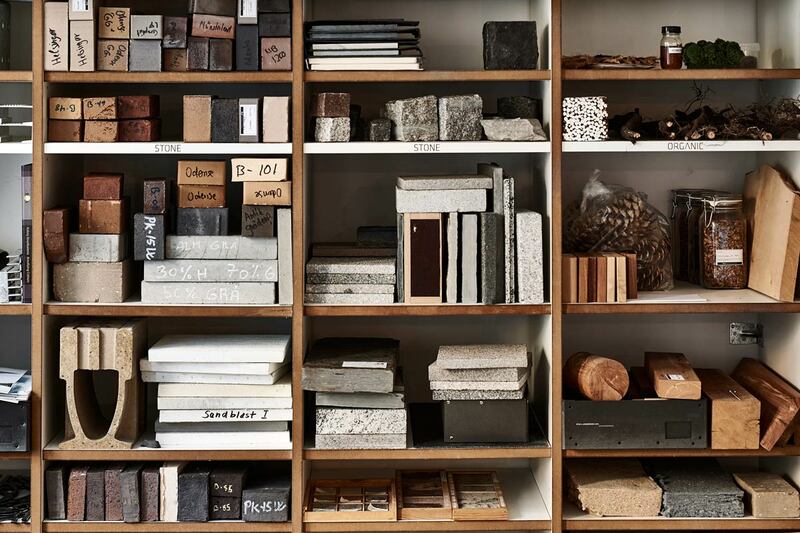 And our collection of nature’s materials dates more than 20 years back consisting of wood, seeds, stone and more than 100 samples of sands from all over the world. 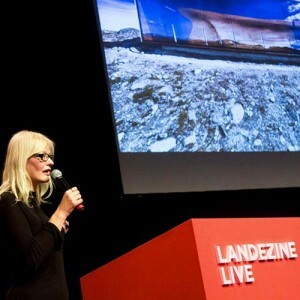 We hope our genuine desire to understand and change the world can be seen and felt in everything we do. 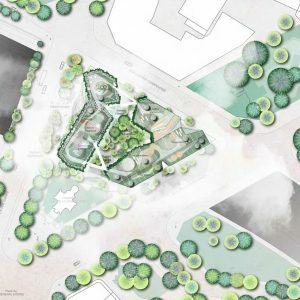 Whatever the challenge, we take on the responsibility to get it resolved, so that it gives the most value back to the client, the users and the wider system of nature. 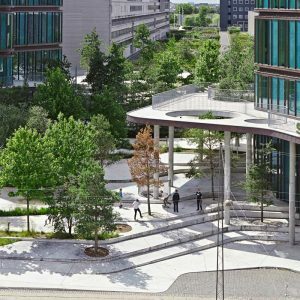 With more and more space in our cities being taken over by private companies, how can we design the “corporate urban space” of the future? 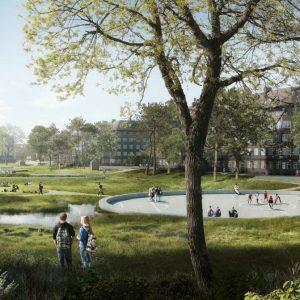 With Novo Nordisk Nature Park, SLA answers this challenge by designing a 31,000 m2 nature park for Novo Nordisk. 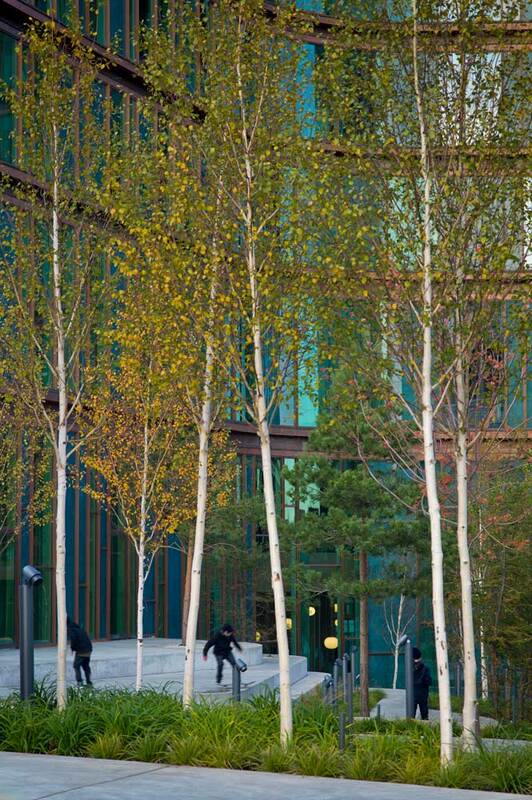 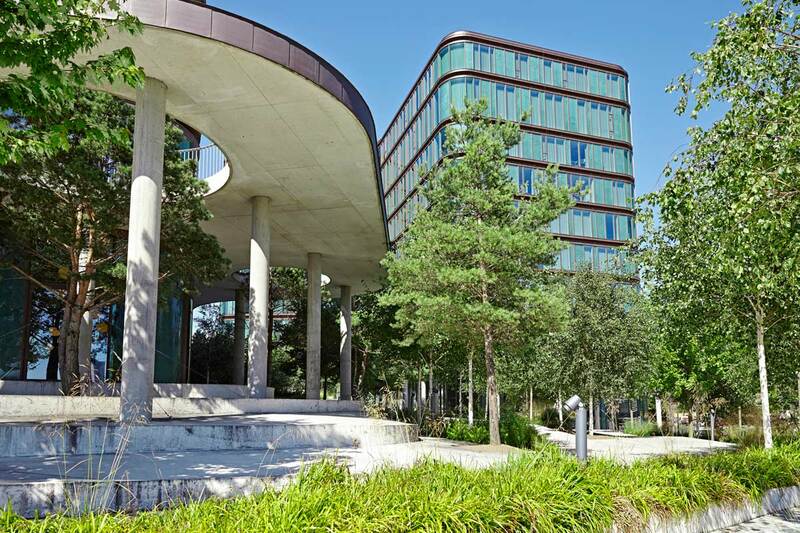 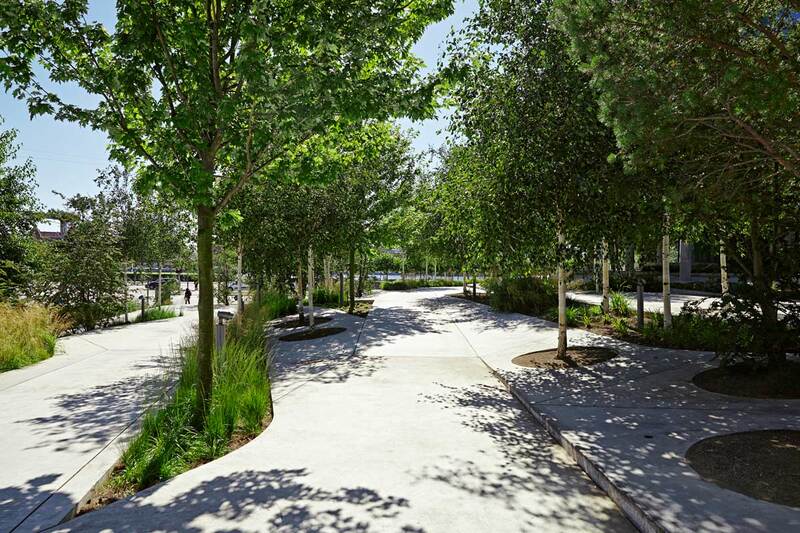 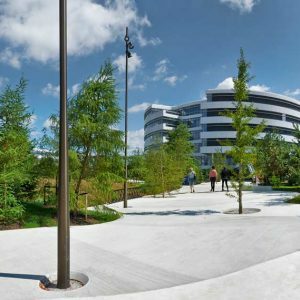 The park is designed to be open to the public and with its more than 2000 new trees, the nature park is a green addition in the industrial urban area. 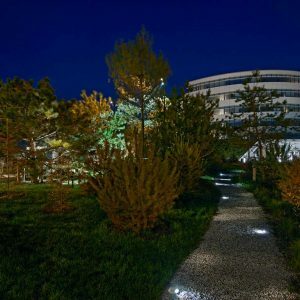 The health and well-being of the users is central to the park´s design, as it is a pleasant and attractive walk for both citizens and the employees among fragrant flowers, gnarled trees, wild vegetation and natural rain lakes. 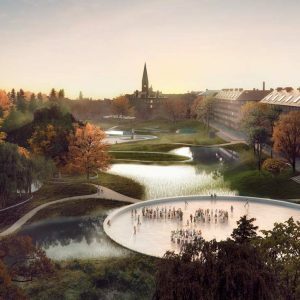 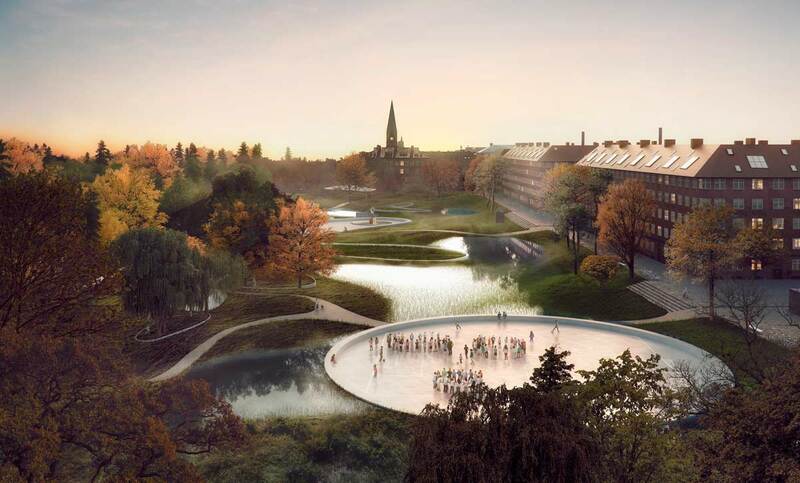 The park’s undulating topography is the first landscape in Denmark designed to hold 100 % water balance as all rainwater is naturally percolated or reused for irrigation. 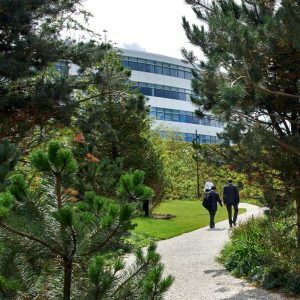 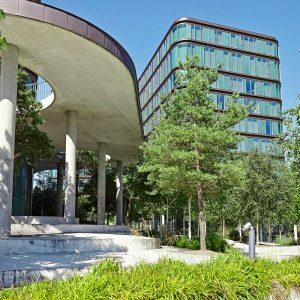 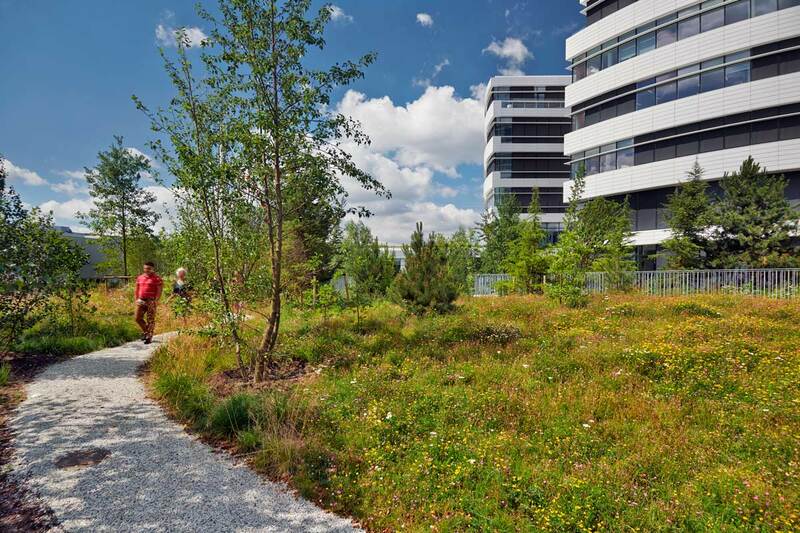 The nature park strengthens Novo Nordisk´s position in the highly competitive pharmaceutical world by using its nature park as one big, outdoor innovation lab. 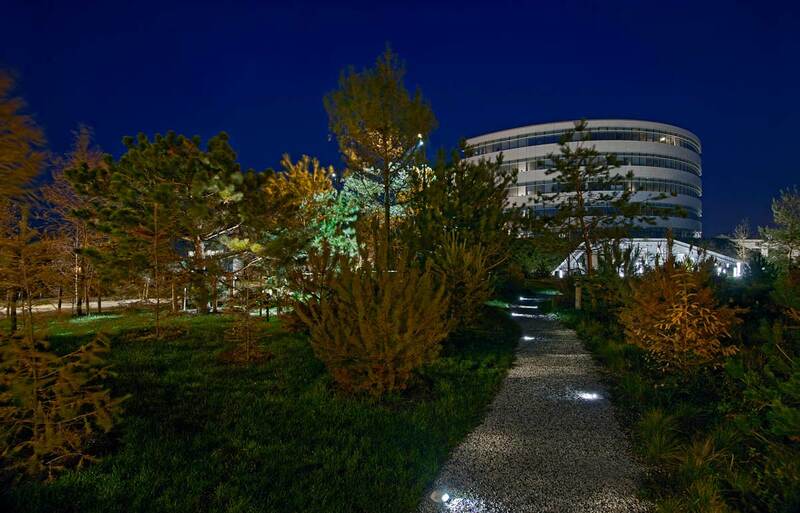 Here the untamed nature provides the employees with a maximum of light, fragrance, colors and sounds, stimulating creativity and innovation. 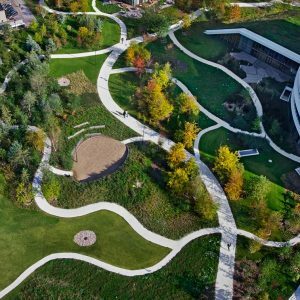 In addition, the winding paths are specially designed to encourage chance meetings and brainstorm walk-and-talks, promoting cross-sectorial collaboration. 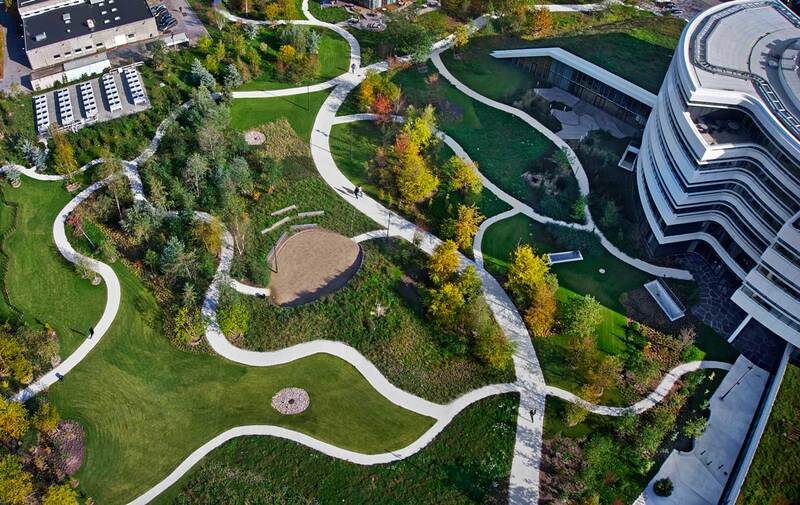 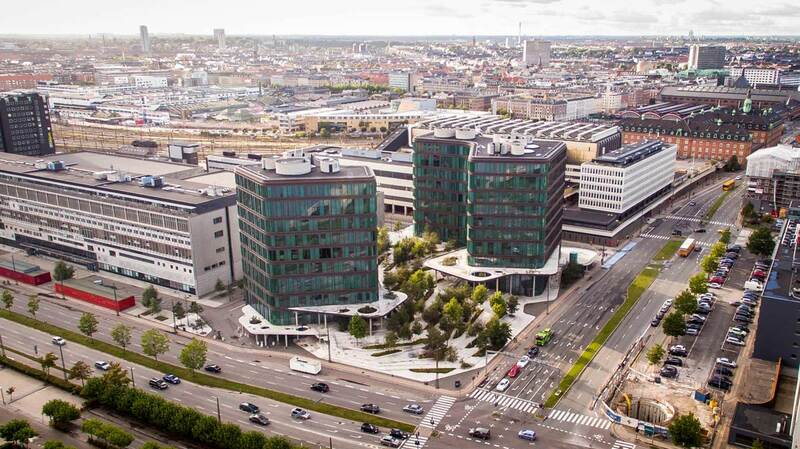 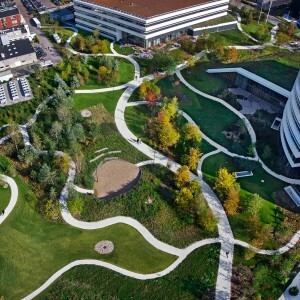 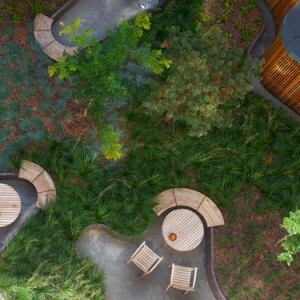 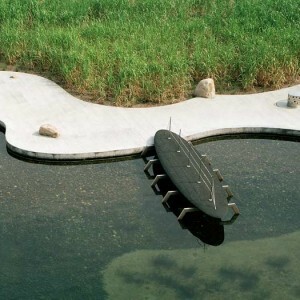 Thus, Novo Nordisk Nature Park showcases how corporations can shift its thinking from seeing outdoor spaces as a cost to be minimized to a long run investment that will benefit both the city, company and citizens. 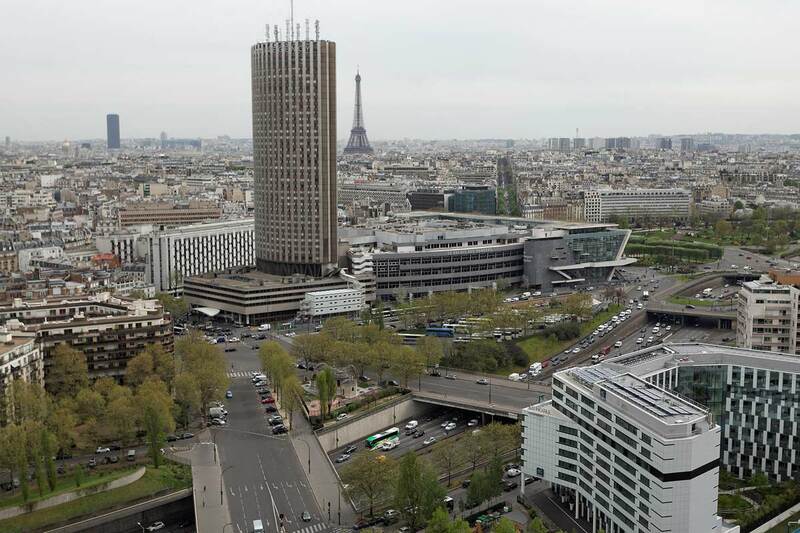 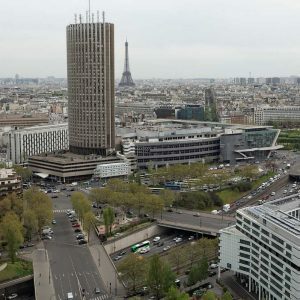 Currently the Boulevard Peripherique – the big ring road that circles the whole of Paris – faces many different challenges: from pollution of the air and rainwater to loud traffic noise. 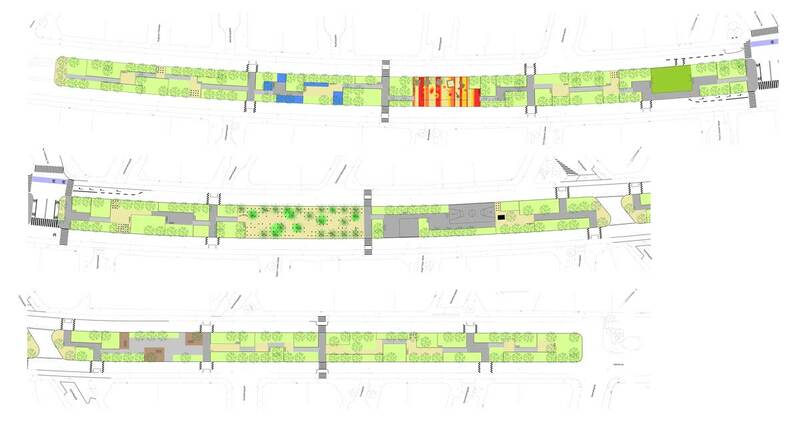 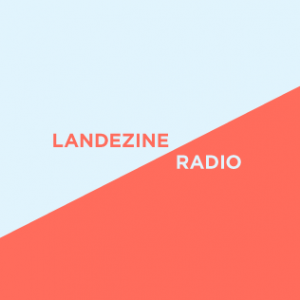 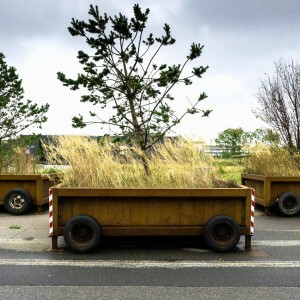 SLA´s project “Reinventer Paris” faces all these challenges, by reimagining the Boulevard as a new performative green-filter machine that acts as a nourishing and biodiverse processing machine, cleansing the ring road beneath it. 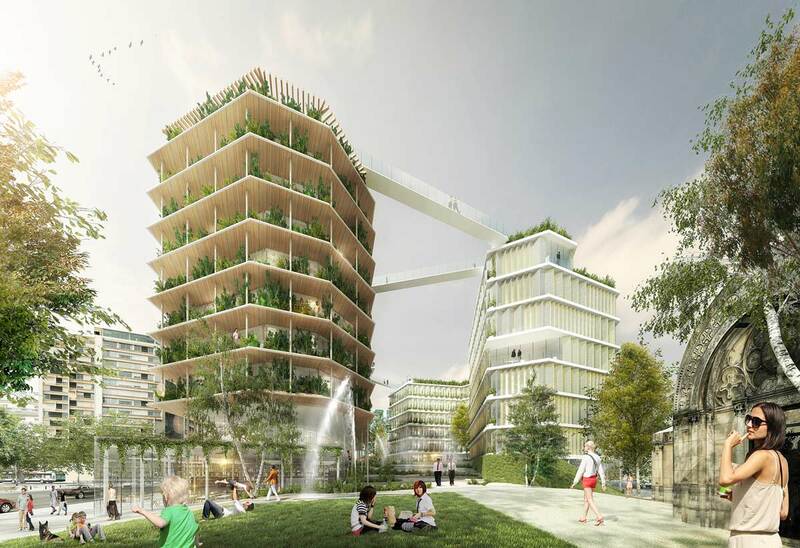 Urban life and city nature in three dimensions is the main concept of SLA’s Reinventer Paris project, that creates a new, distinctive, green urban space directly on top of the Peripherique. 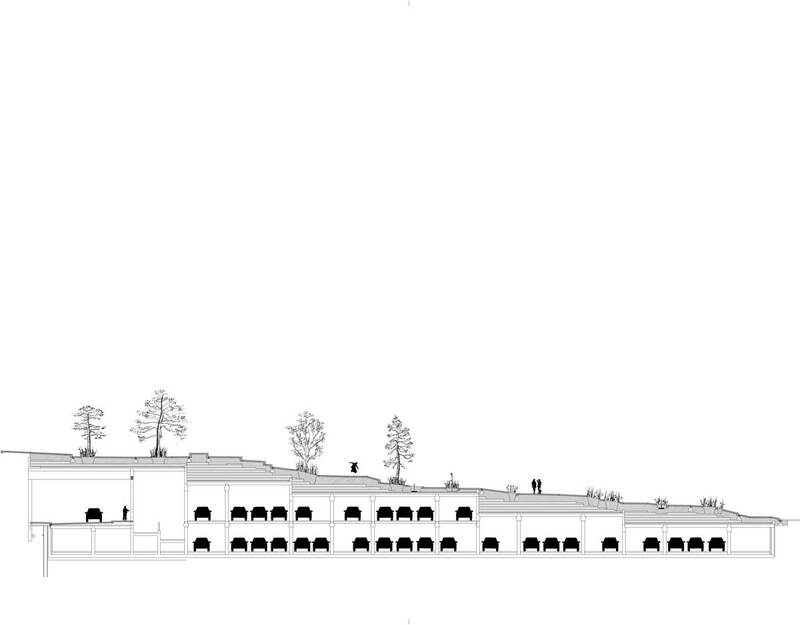 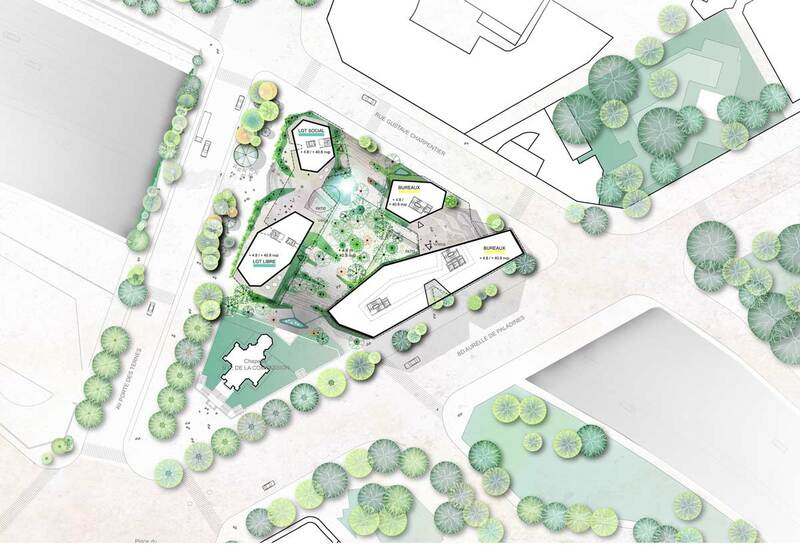 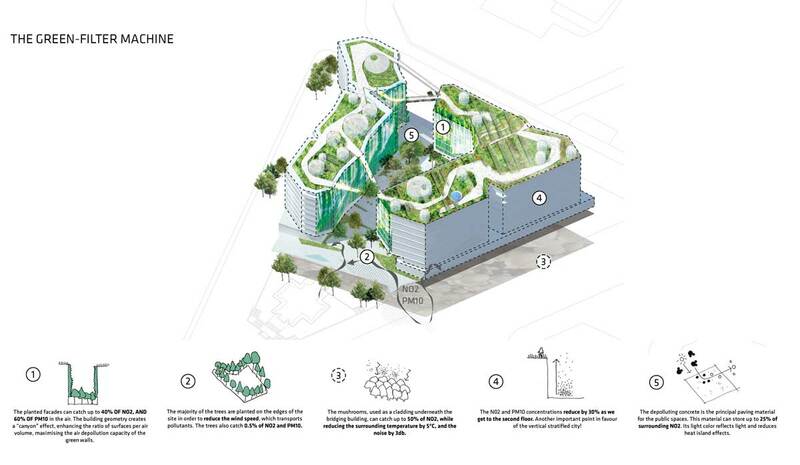 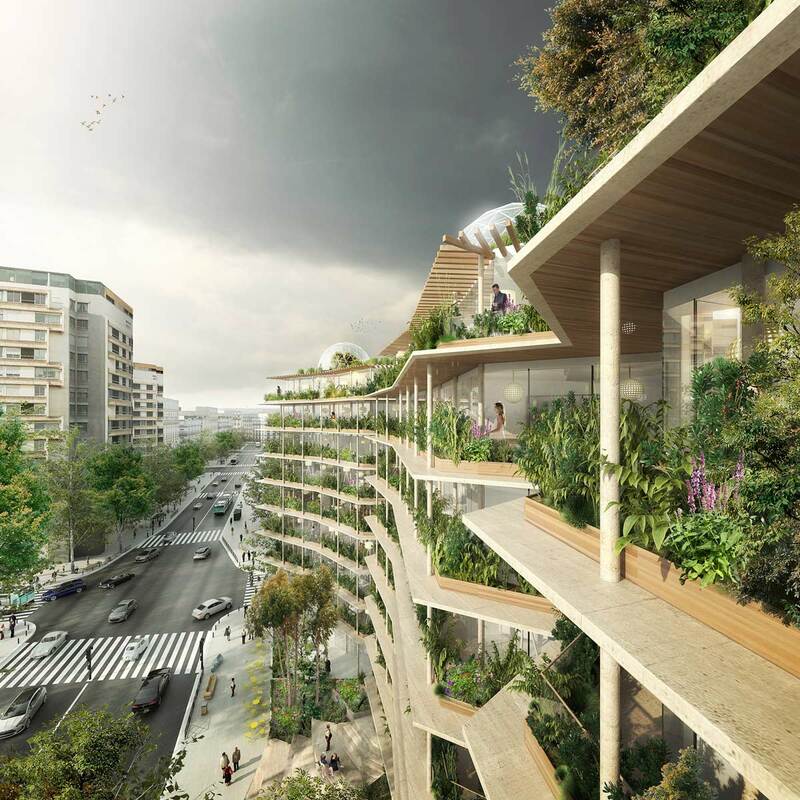 The project combines city nature-based ecosystem services, fully climate-adapted urban spaces and new social meeting places with underground parking, pedestrian-friendly connections and large roof terraces, which among other things will house a big tea plantation. 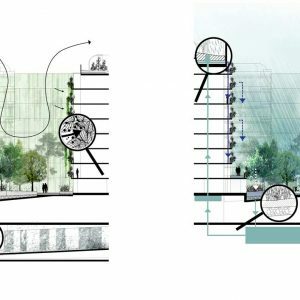 The collected rainwater is reused as an apparatus to filter the air and noise, harnessing negative resources and turning them into positive attributes, creating clean water and air and turning the boulevard into a green recreational space. 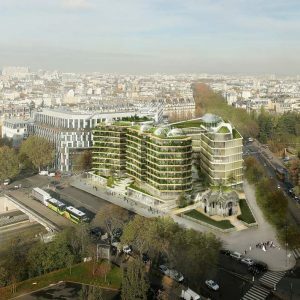 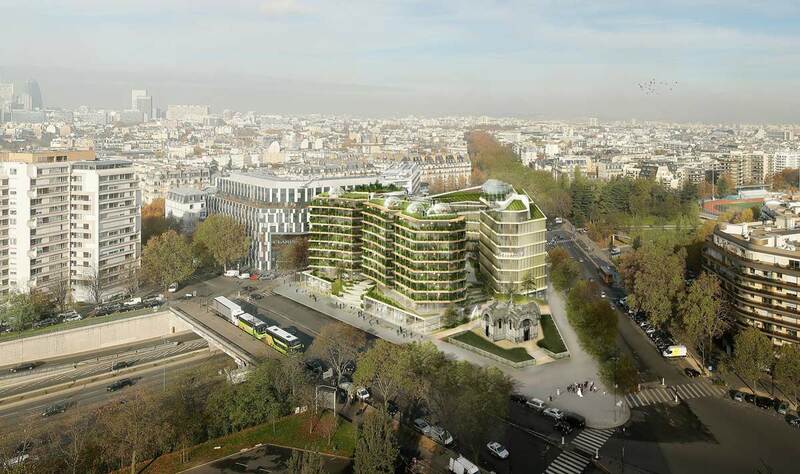 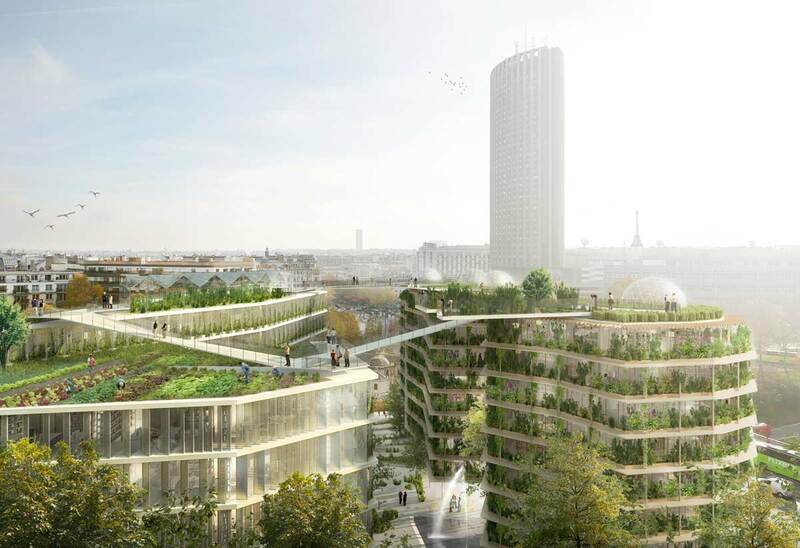 By working with city nature and urban life as complete ecosystems the project creates new urban experiences and a new green context in a gray and traffic-congested part of Paris. 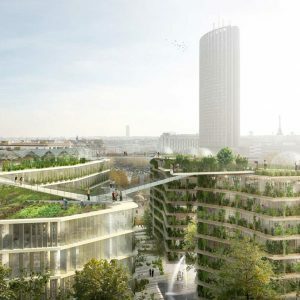 The project not only offers green attractions at street level, but lifts urban life and city nature high over Paris’ roofs – adding a new dimension to what it means to live and work in Paris. 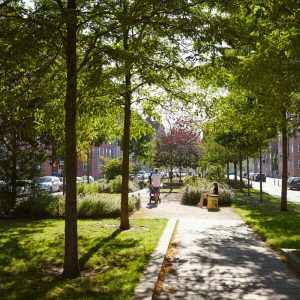 City nature, adaptability and citizen involvement – these are the three important keywords that describe SLA´s renewal of South Boulevard in Copenhagen. 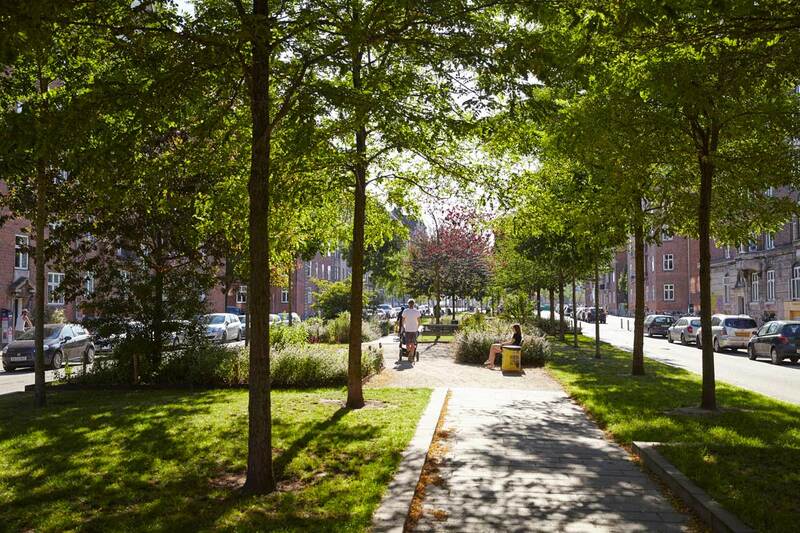 In the past, the boulevard served as a run-down, high traffic road, in an area challenged by crime and social issues. 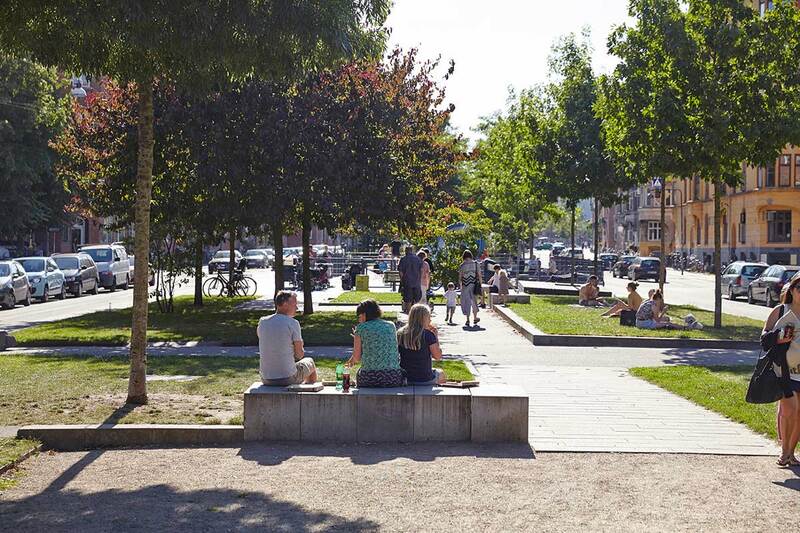 But together with the local citizens, SLA transformed the 1.2 km long boulevard into the vibrant, safe and socially inclusive urban space it is today. 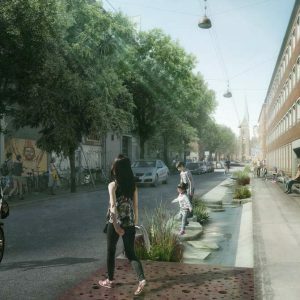 SLA’s renewal of South Boulevard puts the Nordic Model, based on co-creation, dialogue and humanistic nature-based design solutions into practise. 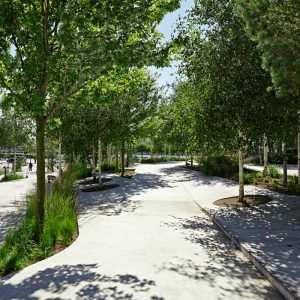 Thus, the boulevard is created through a comprehensive and specially designed community participation process, where the residents were invited to dream and articulate their needs and wishes for their new boulevard. 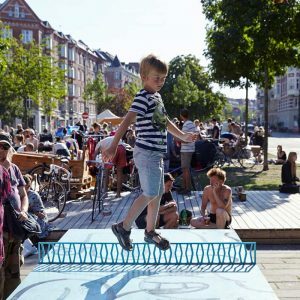 From this participation process SLA developed a flexible framework, which could contain all these dreams – but also adapt and change to the area’s future need. 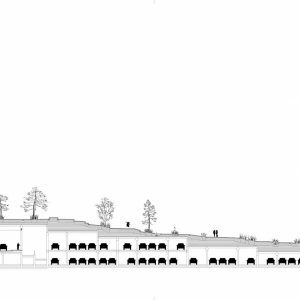 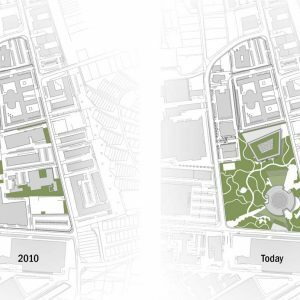 Therefore, space was left vacant, to be filled up by the borough’s inhabitants as a continuing process – based on the conviction that true inclusive and humanistic development of our cities does not end once the architects have gone home – in fact: that is when it starts. 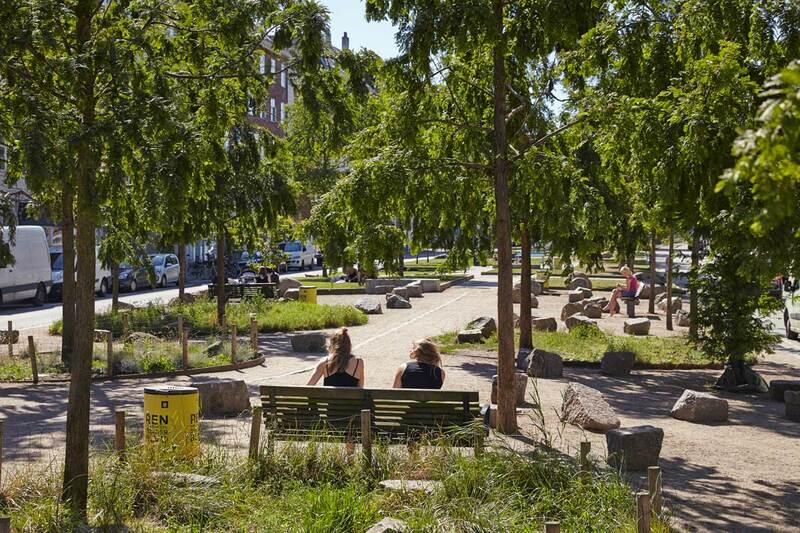 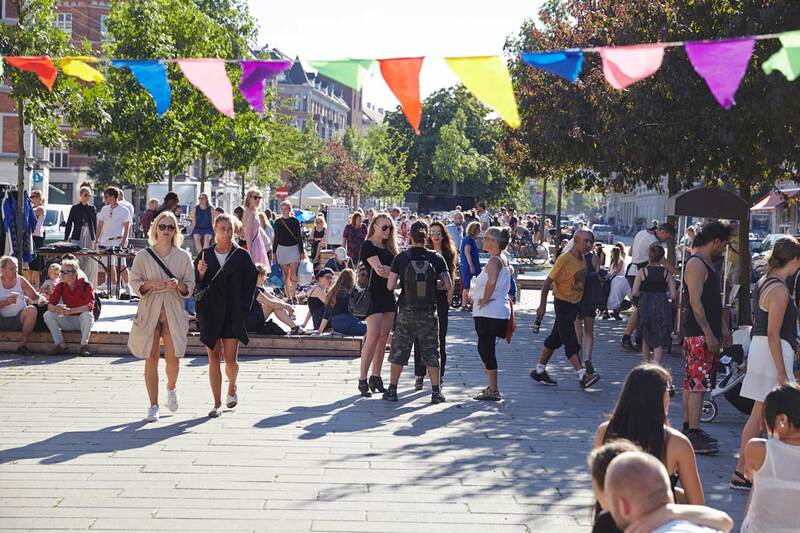 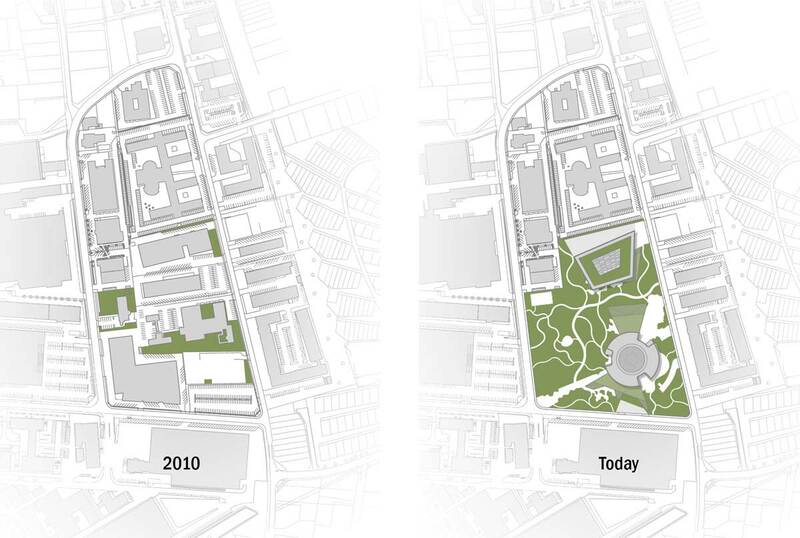 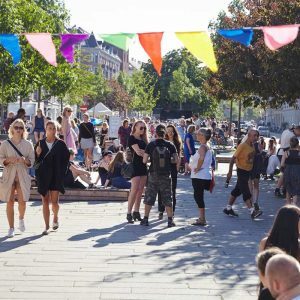 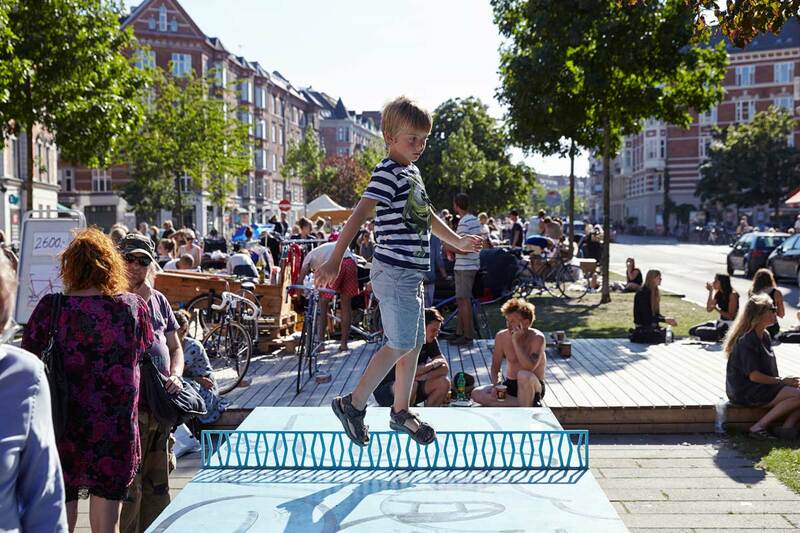 The result is a flexible, lush, inclusive and lively social space with a diverse range of social and recreational activities: from wild vegetation to urban gardening, basketball courts, playgrounds and benches – and one of Copenhagen’s most popular urban destinations. 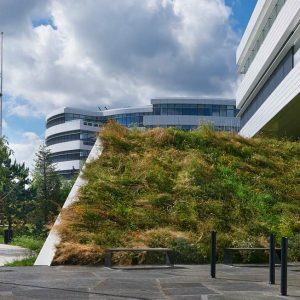 SLA uses the processes of nature to create a democratic, lush and multifunctional urban space for the Swedish SEB Bank’s headquarter in Copenhagen. 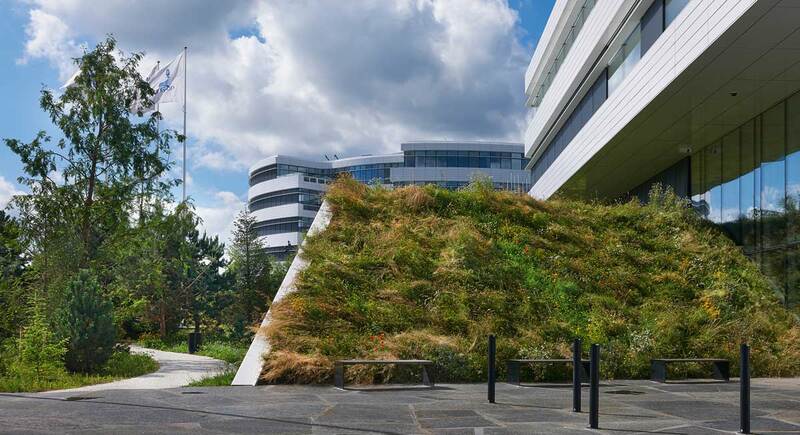 Inspired by Nordic sand dunes, SLA’s project “The City Dune” is made of white concrete, intersected by Scandinavian nature. 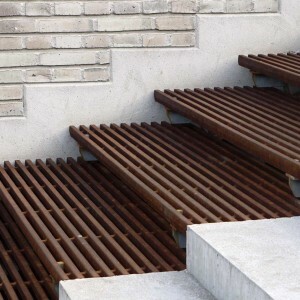 Its steps and inclined surfaces generate a complementary relation between the urban space and the office buildings as it rises from street level to the second-floor level, covering the side and the roof of the bank’s parking garage. 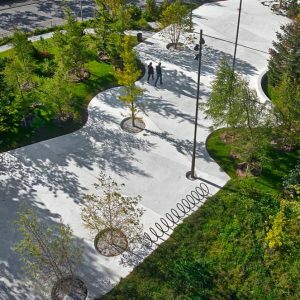 The folding movements of the white concrete not only reflects the sun, it also handles functional and technical demands for collecting and reusing rainwater. 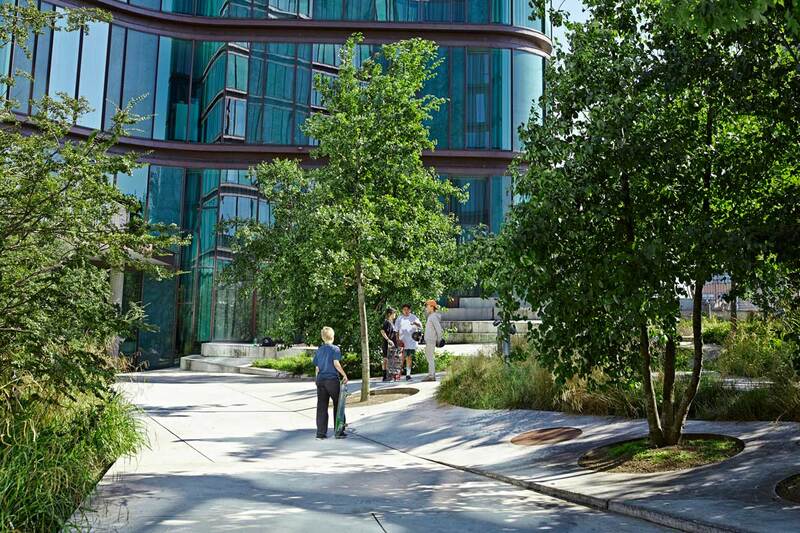 The rainwater is used for irrigation and to supply the water atomiser that emit moist air, creating a feeling of being close to nature while cooling down the urban space during summer. 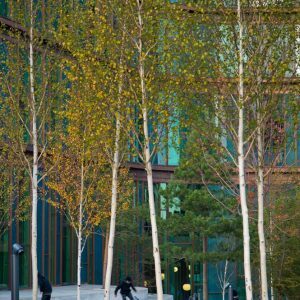 The trees and plantations are not arranged to emulate nature, but to add a new manner of seeing and experiencing nature in the city. 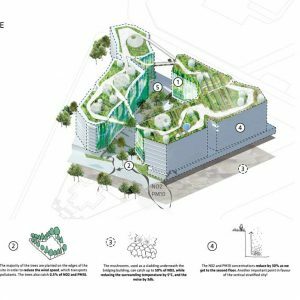 The ambition is to create an urban view of nature through a design that clarifies the presence of nature as a process, while simultaneously supporting acclimatisation and other functional conditions. 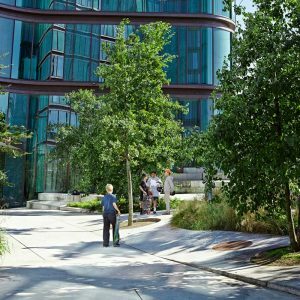 By using nature and its processes as launch pad, The City Dune adds both aesthetic and functional values, as it provides sensuous experience, improved microclimate, stormwater management, full accessibility and an attractive green heart in middle of the city. 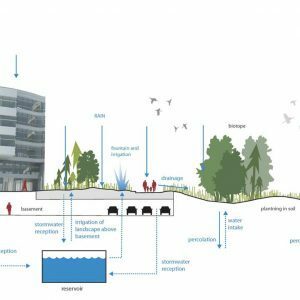 Water – whether the increase of it, the pollution of it or the lack of it – is going to be one of the main urban challenges of the 21th Century. 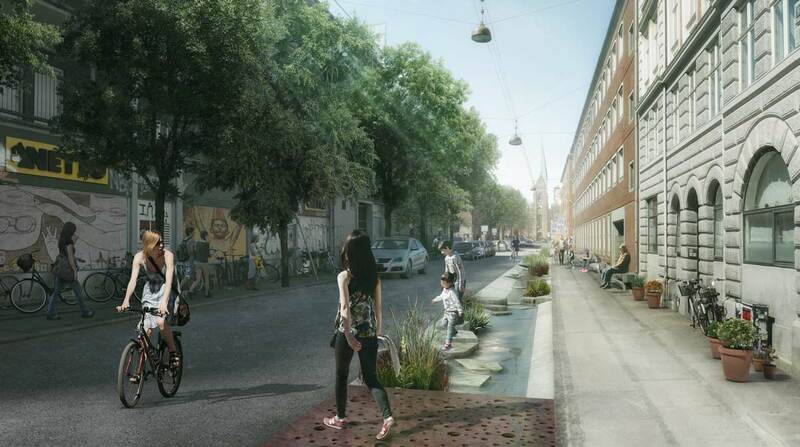 SLA’s project THE SOUL OF NØRREBRO addresses this issue through a New Nordic Model to city development. 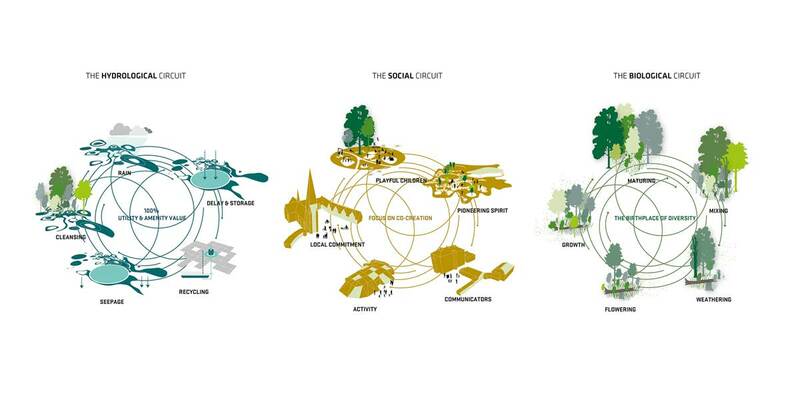 The model is highly scalable based on co-creation, dialogue and humanistic nature-based design solutions. 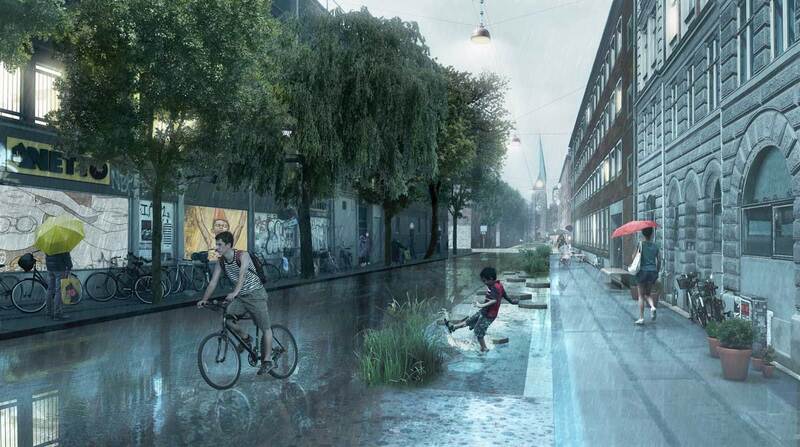 And which simultaneously solves physical, social and cultural challenges in our cities. 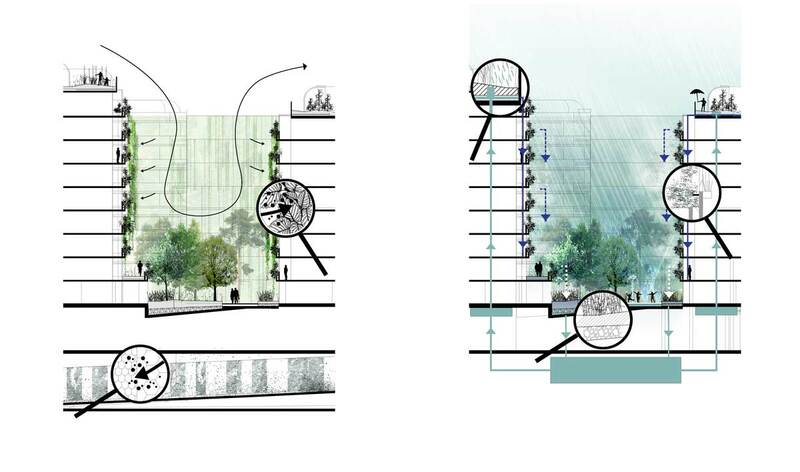 SLA’s project aims to address the issues caused by climate change by seeing water as a resource to solve urban challenges while enhancing life in our cities. 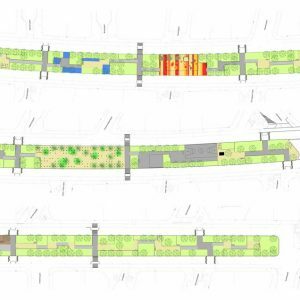 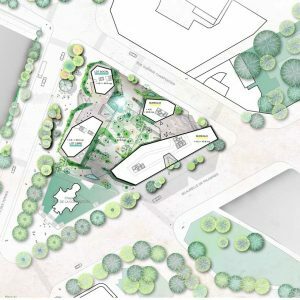 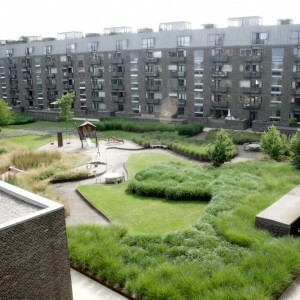 The project is an integrated urban design and climate adaption project combining city nature, local community and smart cloudburst solutions, building upon the area’s existing qualities. 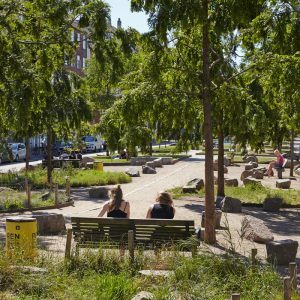 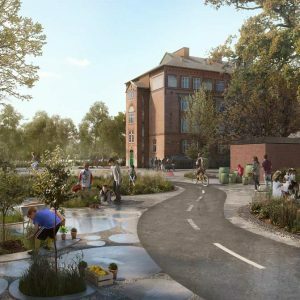 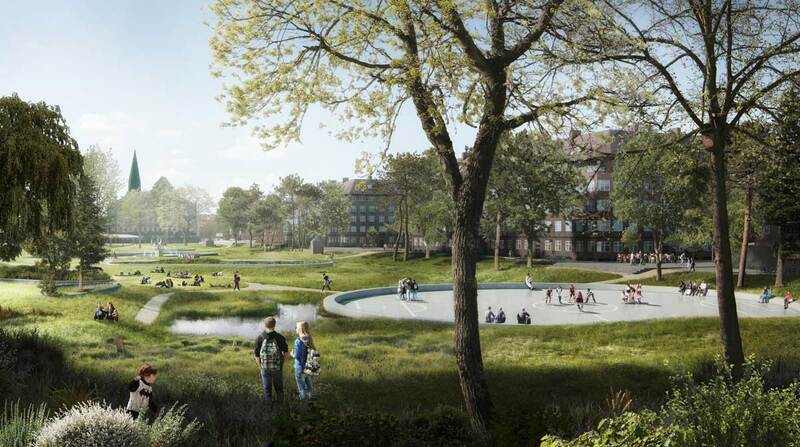 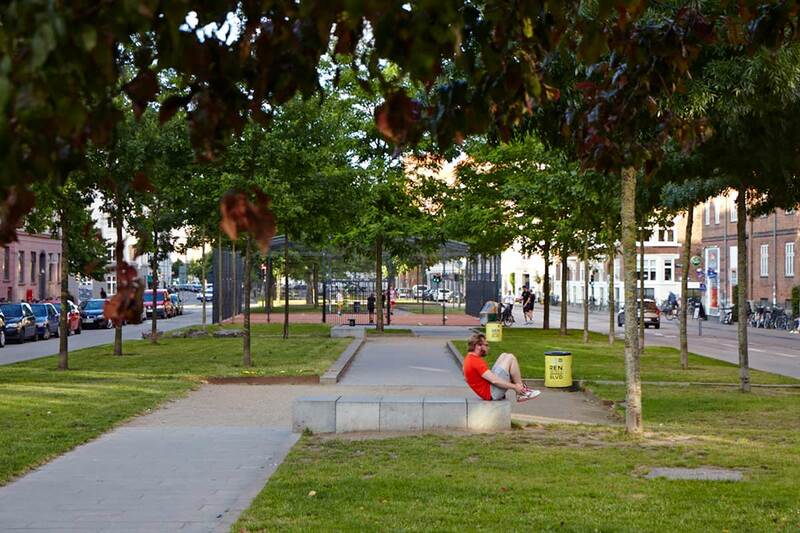 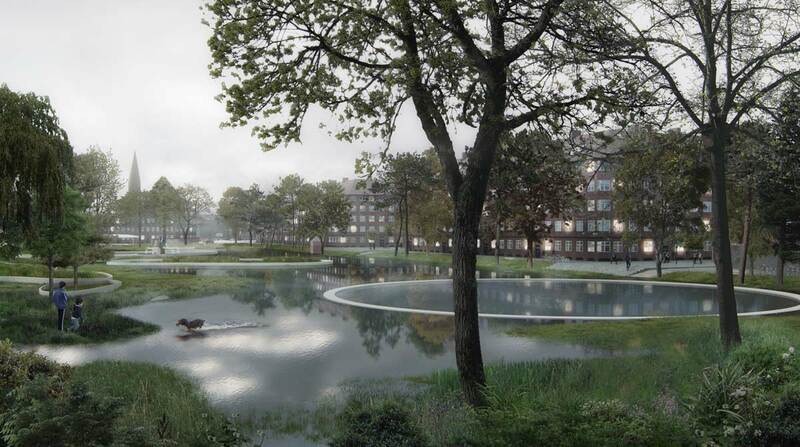 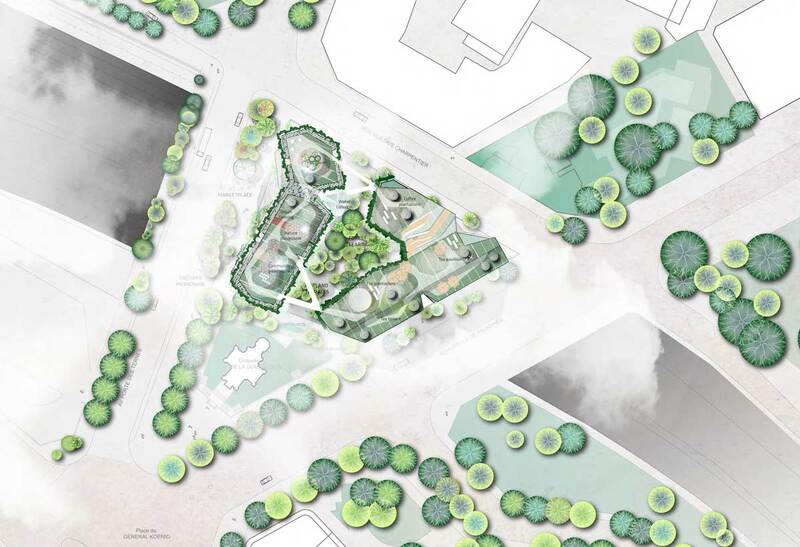 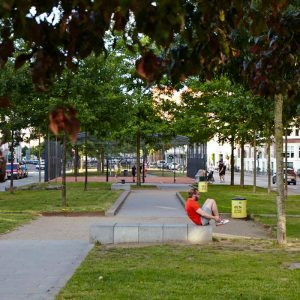 The main objectives for the climate adaptation and renewal of Hans Tavsens Park are the redirecting of rainwater while creating new attractive urban spaces. 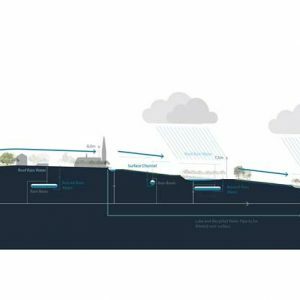 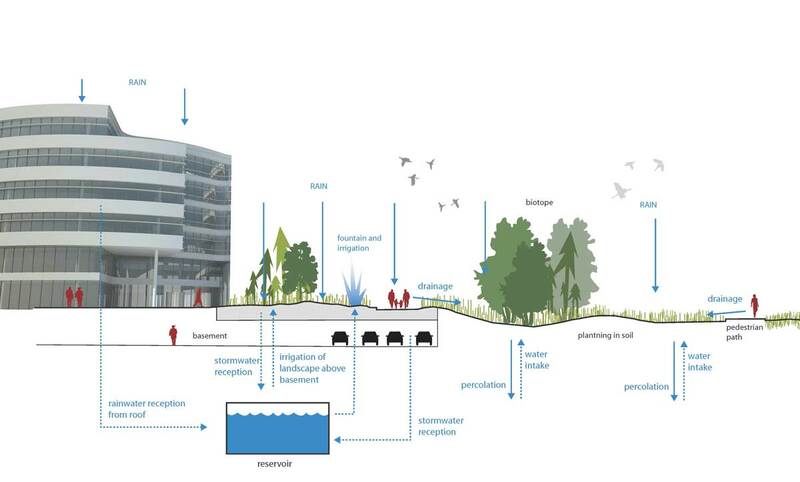 Rainwater is collected and used locally while excess water from cloudburst is lead into the Copenhagen Lakes, cleansed by city nature biotopes along the way. 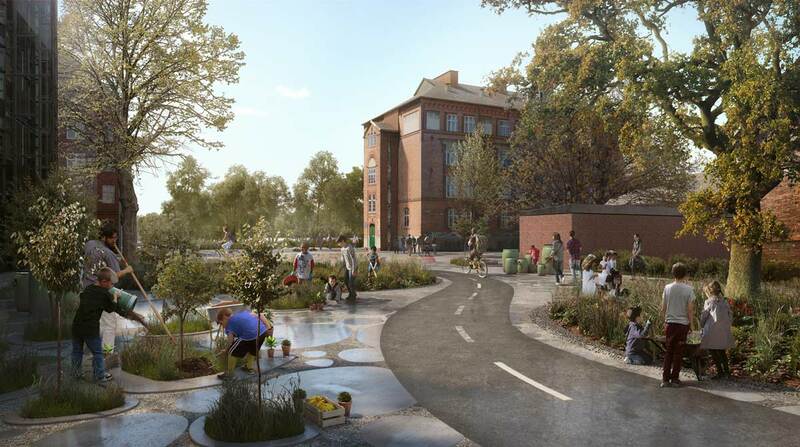 Local schools and stakeholders are integrated in the implementation of the project and establish a strong local ownership and identity that ensures a long-lasting development of the neighbourhood. 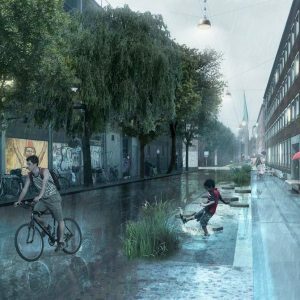 Thus hydrological, biological and social circuits will work together in a strong symbiosis that does not only climate proofs, but also has a positive effect on the entire city.